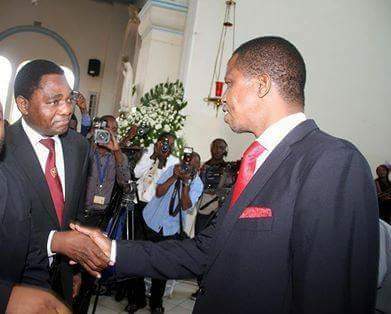 Hakainde Hichilema says it is unfortunate that President Edgar Lungu is attaching conditions to the Commonwealth-initiated dialogue but says he is not surprised because the Head of State known for shifting goal posts. President Lungu yesterday said the Patriotic Front is ready to dialogue but that the process should be led by the Zambia Centre for Interparty Dialogue (ZCID) and the Commonwealth. The President told UN resident coordinator Janet Rogan who paid a courtesy call on him at State House that it is wrong for external forces to lead the process with set conditions in a sovereign state like Zambia. But UPND leader Hichilema said in a statement today that President Lungu’s remarks are indicative of his “chipante-pante” style of governance. “The statement by State House quoting Mr. Edgar Lungu giving conditions for dialogue is very unfortunate to say the least. But for us who have known Mr. Lungu and his PF leadership for changing positions on many issues, this does not surprise us,” stated Hichilema. “They have changed position on economic, social and political issues in their famous “chipante-pante” fashion. These inconsistencies have led to the current social, economic and political challenges the country is facing. “On the issue of dialogue, Edgar Lungu and his PF leadership have been quoted on several occasions saying there was no tension in the country and have never seen any need for dialogue with anybody. He accused the PF of acting against the spirit of dialogue by going ahead with constitutional amendments without consulting other political players. “With impunity and in total disregard of the spirit of dialogue, which among other things demands consultations among parties, they have unilaterally gone ahead with the process of amending the constitution again. Yet this is the same document we had warned about in 2015, that it had several flaws. Hichilema said it is preposterous the President Lungu can turn on the Commonwealth now that plenty of ground work has been done. He added: “Dialogue should be unconditional and we are surprised at the comments Edgar Lungu made while meeting with the UN Resident Coordinator. “And since Edgar Lungu made the preconditions for dialogue while meeting the UN Resident Coordinator Janet Rogan, we challenge the UN and particularly UNDP and the Electoral Commission of Zambia to publicly release the November 2017 ‘Conflict Structural Vulnerability Assessment (SVA) – Zambia’ report which was Supported by the UNDP Support to Election Cycle Project in Zambia. This demoniac called lungu has to go together with his puppets.